* Please select prefered coupon type ! Drop an image or browse it from your computer. What type of contact QR Code is this? My personal contact QR Code. I'm making it for someone else. * Please select one of the fields ! ATTENTIONContact QR Codes cannot be changed afterwards. And as any piece of additional information creates a bigger QR Code - more information equals more QR Code pixels -, you should use only the absolute minimum of information necessary. The bigger the QR Code is respectively the smaller the QR Code pixels are, the more difficult it is to scan your code. You can encode any type of textual information in a QR Code, for example your website's address, a Facebook page, a coupon, a contact. Once published on paper, any other physical support (or even on the web), people with a QR App can scan your QR Code. 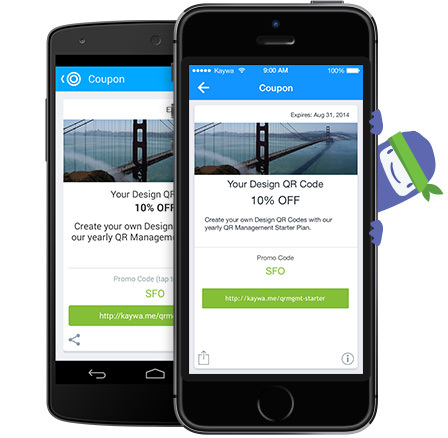 By scanning they decode the information and the app then renders the website, the Facebook page, the coupon or the contact. an awesome communicator to really benefit from them. Point to a website that is optimized for mobile devices or else choose our coupons, contacts or your Facebook page. Use our “Design QR Code” creator, to instill life in your black and white QR Code. Brand your QR Code to make it stand out. Tell people to download your preferred reader and then to scan the code, for example: “To scan: download the Kaywa Reader from the App Store & Google Play"
QR Codes come in two types, either static or dynamic. We always recommend to use dynamic codes. Static code simply encode the information. 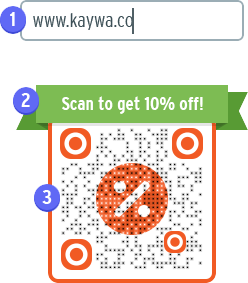 With Kaywa you can create an unlimited number of static QR Codes free of charge. More interesting are dynamic codes and our QR MGMT only stores these. Dynamic codes can be changed, tracked and they are ideal for scanning with a mobile phone. If you don't find what you are looking for in the above plans, if you need over 500 QR codes or if you have a special request, we recommend you contact us directly. If you need first to check back with your department or boss about which plan to choose, but you still need to create a QR Code now, we also offer our “Choose Later” option. It enables you to create the QR Code right away and start using it in your marketing & printing collateral. This plan comes without the possibility to change the address, without tracking nor analytics and without any design options. Your QR Codes can be upgraded anytime by choosing a paid plan.